We even decorated the cargo box to celebrate. Any hint how old they are? Happy Birthday to the boys!!! I'm repeating myself, but great photos! Looks like they had a very fun birthday. 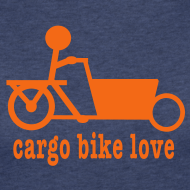 The t-shirts are very cool, they are lucky they have such a crafty mom. Yay!!! Happy #7 C and S! And congratulations S and P for making it this far with twins...you are an inspiration! Happy Birthday! 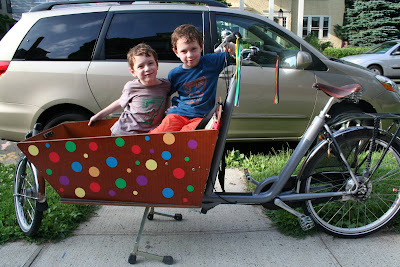 Those decals look great in the cargo bike! Your twins are adorable, and I love the shirts! Seven is a great age.